Container Frame mud system is very popular in Australia because of fast moving for inland delivery. AIPU Solids Control built 2 sets of container frame mud system for an Australia client for horizontal directional drilling (HDD) rig. The shale shaker and mud mixer installed on tank top with a container frame for loading tank. All equipment will stay on top of tank without disassemble when inland transport. The pumps lay on tank skid bellow tank bottom for fixed installation without moving. All equipment and component installed on mud tank within a container frame. So that all equipment no need for disassemble for inland transport. Each corner of container frame will fit a loading point for loading application, bottom loading point for loading tank onto trailer. All connetions are fast connection, so that jobsite connection or disconnection can be fast to suit drill site requirement. Shale shaker installed on top of tank for drilling cuttings separation. Screen is supplied as per API RP 13C regulation. Mixing hopper installed on top of tank for mud mixing. Mixing pump installed on tank skid to allow pump fixed with tank without disassemble. 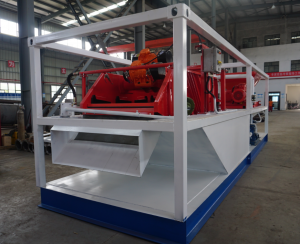 Container frame mud system is a very cost effective and best solution to suit HDD drill site. Details design and pipeline arrangement can be supplied as per customer’s request. Please visit our website for more information and contact us freely.